So with Guillermo Del Toro having won Oscars galore for The Shape of Water it gave him licence to make whatever he wants. 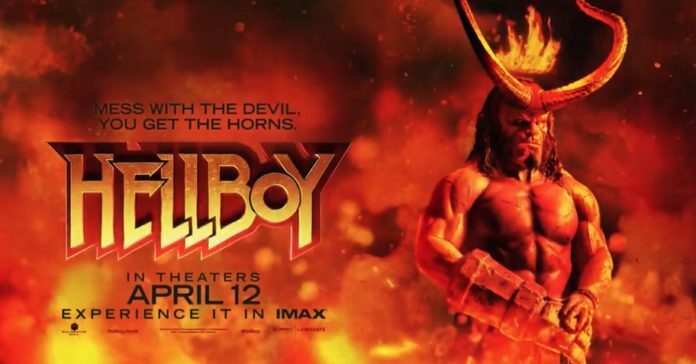 Unfortunately he’s chosen not make a third Hellboy film and he’s not the only one to bow out with Ron Perlman et al following suit and instead Brit director Neil Marshall helms this part reboot – part new story with David Harbour as the titular horned hero. Opening with a black and white prologue featuring King Arthur and arch enemy The Blood Queen (no, we don’t remember her from the Arthurian legend either) who is about to eradicate the human race with a plague but instead finds herself dismembered and her limbs locked in boxes and scattered to the four corners of the world in a bid to keep her evil at bay before we’re thrust into the modern day where Hellboy continues, and fails, to work incognito to the world. With John Hurt no longer with us it falls to Ian McShane to take on the fatherly role of Professor Bloom and its him and a secret society , the Osiris club, revealed in one of many many flashbacks of back stories that illustrates the origins of Hellboy but also how Hellboy himself is key to the future of the human race. 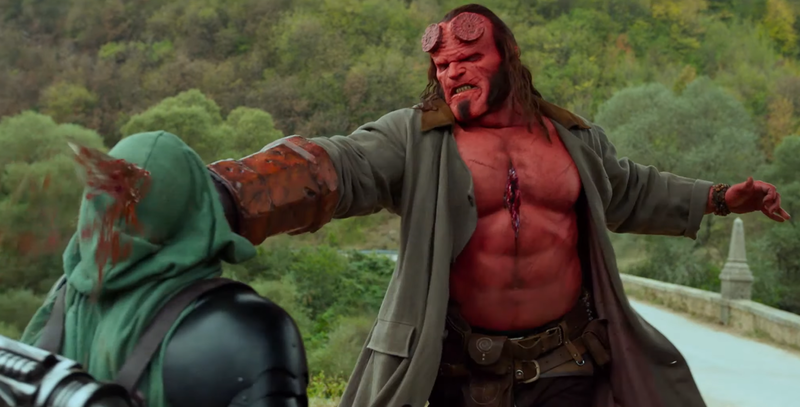 Written by first time feature film writer Andrew Cosby this latest Hellboy has some odd moments most notably a potty mouthed, psychotic scouse pig voiced by Stephen Graham that sets about finding The Blood Queen’s limbs in order to put her back together to taken dominion of the earth and for him to have his revenge on Hellboy due to a petty encounter he had with him years previously. Running at 2 hours there’s a lot of flashbacks in this which, though entertaining enough, distract from what is the usual good guy fighting bad guy who wants to take over the world with the twist here being that Hellboy, if he does see off the Blood Queen (Milla Jovovich), could inadvertently make himself the Beast of the Apocalypse himself something of a plot hole having overlooked that Amanda Holden walks among us already. From the very opening shot where a crow pecks out the eye from a corpse Neil Marshall’s film is going to be a different beast form Del Toro’s version of the comic book character. Whereas Del Toro’s was fantastical, Marshall’s is gory…….very gory and it’s not helped either by this being something of a CGI fest perhaps best illustrated when one of the characters morphs into a leopard that’s not dissimilar to the transformation in An American Werewolf in London and serves only to remind how much more satisfying it is as a practical effect. 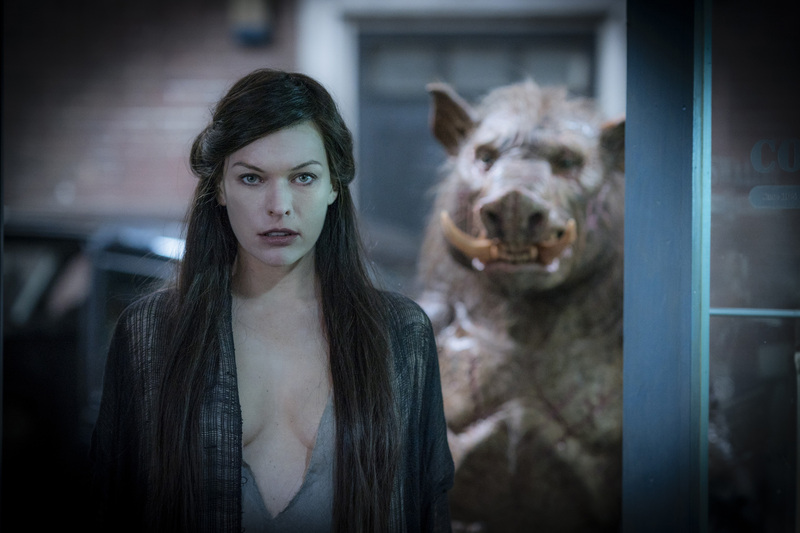 As Hellboy David Harbour is OK but many of the comic quips fall flat and as his nemesis Milla Jovovich is adequate. 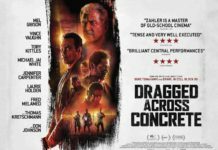 The film also misses the presence of Abe Sapien (Doug Jones) & Liz Sharman (Selma Blair) replacing them with Major Ben Daimo (Daniel Dae Kim) and Alice (Sasha Lane) who are vanilla in comparison. 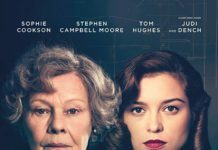 Not the disaster that some have this down as being but it is a big disappointment and the mid & end credits scenes that suggest a further sequel might be a little too optimistic. Next articleWill we ever see a Woody Allen film again?